Funeral – 10:00 am, Wednesday, 29 March 2017 at Holy Family Church, Albuquerque. There may possibly be a wake service on Tuesday evening, 28 March, but that is not yet definite. Please continue to keep +Wayne, his sister Betty Gibbeaut Hammack, brother Sid Gibbeaut, nieces and nephews, in your prayers. Fr. Wayne Gibbeaut, OFM, who served for years as pastor of St. Joseph Parish and its missions until his recent transfer, died on March 15, 2017. May the Most High give you peace. Within the last few minutes I have received word that our brother, Fr. Wayne Gibbeaut, O.F.M. died this afternoon at St. Mary Medical Center in Huntington, WV. Fr. Wayne had been hospitalized since early February, following a lingering set of illnesses which had beset him over the last few years. Despite his pain and the trials of his ill health, he had faithfully ministered until last summer to the people of Acoma and Laguna Pueblos in the Diocese of Gallup for several years and before that had most recently served in the Archdiocese of Santa Fe as Pastor of Our Lady of Guadalupe Parish in Pena Blanca, New Mexico with its Pueblo missions of Cochiti, Santo Domingo and San Felipe. Previously, he served the people of Tesuque, Santa Clara and San Ildefonso Pueblos as well as Jemez Pueblo, Santa Ana, Zia, San Ysidro, Canon and Ponderosa. His last few months have been spent with his sister Betty Hammack, brother Sid Gibbeaut and nephew and niece, Dr. John and Ann Hammack all in his native West Virginia. Fr. Wayne traveled to West Virginia last August on vacation before becoming gravely ill. All of Fr. Wayne’s family, and especially John Hammack, a physician, have been invaluable in the assistance which they provided Fr. Wayne. The Very Rev. G. Borgmeyer of St. Joseph Parish in Huntington had administered the last rites to Wayne night before last. I think that there is a certain irony that Fr. 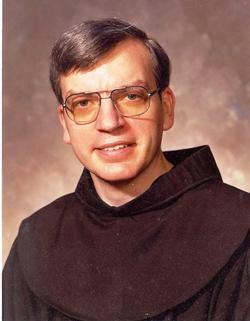 Borgmeyer is pastor of a St. Joseph Parish and Wayne’s last ministerial assignment with the friars had included serving as pastor of a St. Joseph Parish in Laguna Pueblo, NM. Funeral and other arrangements are incomplete and will be communicated to you as soon as they are made. Updates regarding the funeral, memorial service, and burial will be made here when they are available.